eBay First Aid Refill Supplies Always Fast & Free Shipping! All of these Ointments & Creams as well as OTC Medicine's are Brand New and Sterile Sealed from the Manufacturer. We have the longest Expiration Dates possible. Our 100% Organic Blood Clotting Powder is fast and effective, a great Celox alternative. We ship same day and very fast! Your contents will be securely packaged in a 4-mil thick, weatherproof bag for easy on the go storage. Store these essentials in your Car, Home, Boat, when Travelling and anywhere else you go! Stay ahead of ailments and inconvenient situations with these essential supplies. Enjoy Free Shipping on all of our items. Stay Safe. 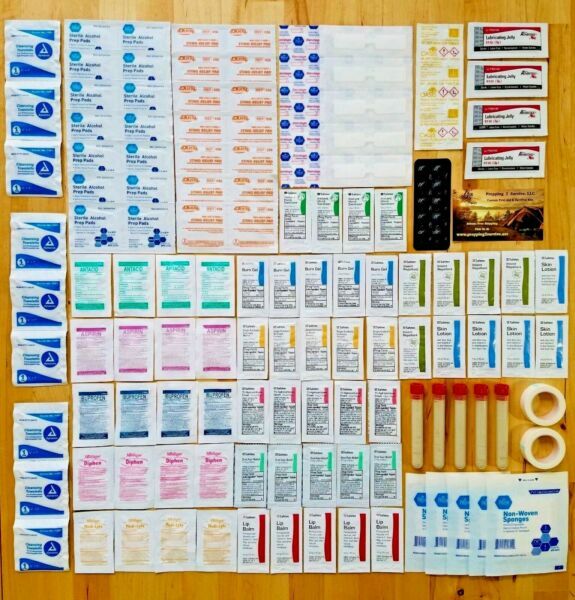 Included in this kit: 5 - 5 Gram Tubes of Wound Sealing Powder (Instructions Included, 100% Organic, Fast & Effective) 2 - 3M Micropore Waterproof Tape Rolls 12 - 2x2 Sterile Gauze Pads (2 per pack, 6 packs) 10 - Medium Butterfly Bandages 12 - Sting Relief Pads (6% Benzocaine) 10 - OASIS Water Purification Tablets ( Sterile Sealed, 1 tablet treats 1 liter) 12 - Sterile Alcohol Prep Pads (1 Per Pack, Isopropyl Alcohol 70%, Sterile) 4 - Ibuprofen Packets (Sterile Sealed, 200mg each tablet, four packets, two per packet) 4 - Diphenhydramine Packets (Sterile Sealed, 25mg each tablet, four packets, two per packet) 4 - Aspirin Packets (Sterile Sealed 325mg each tablet, four packets, two per packet) 4 - Surgical Lubricating Jelly (Bacteriostatic, Latex-Free, Sterile) 5 - Single Antibiotic Ointment (Sterile) 5 - First Aid Burn Gel (Sterile) 4 - Medi-Lyte Packets (Electrolyte Replenisher, Four Packets, 2 Tabs Per Pack) 4 - Hand Sanitizer Packets 5 - Oral Pain Relief Packets (20% Benzocaine) 5 - Lip Balm Packets 5 - 1% Hydrocortisone Cream Packets 5 - Skin Lotion Packets 5 - Insect Repellent Packets 4 - Antacid Packets (Four Packets, 2 Tabs Per Pack) 9 - Sanitary Towelettes The use of items from Prepping_2_Survive, LLC. requires prior medical knowledge and training of ALL products sold to ensure proper use. Both warranties and liabilities are not assumed, either expressed or implied. The BUYER is charged with the responsibility for ultimately determining suitability for their use. Prepping_2_Survive, LLC. and it's affiliates assume no responsibility whatsoever for any liability resulting from product use, including but not limited to special, consequential, and punitive damages. KEEP OUT OF REACH OF CHILDREN.